This festival is celebrated in Tarimbaro with the presentation of the famous Toritos de Petate (dance or pantomime of a bullfight with one person wearing a straw-matting-covered frame designed to represent the bull). It's a bit different than Mexico's larger Carnaval sites, but equally as exciting. Celebrated throughout the region but especially in Morelia and Tarimbaro, the Holy Week is observed with enactments of passion Play and with a visit to the churches. On Good Friday, Morelia holds its Procession of Silence. 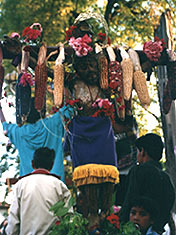 The village of Cuitzeo holds a fiesta in honor of the Lord of the Calvary. Morelia also celebrates Palm Sunday with a handicrafts exposition. This exposition includes artistic events, cockfighting and midway. Commemorates the city's foundation with public ceremonies. Capula observes the Fiesta de St. James the Apostle with processions, bazaars, music, pirekuas contest and handicrafts exhibitions. Morelia is the site for the Shout of Independence (Grito de Independencia), ceremony at the Palacio de Gobierno. There are open-air festivities, public parades and fireworks. Commemorates the birthday of Revolutionary hero and native son, José María Morelos with a civil and military parade, a pilgrimage, bullfighting, sporting and cultural events, fireworks and bands. The Day of the Dead festivities celebrates the returning of the souls of the departed. All Saints Day is November 1st when the children's souls return and All Souls Day is the 2nd when the adult sould retunr to earth. For more on this, click on Dias de Los Muertos. One of the more popular spots to see and interact with this unique festival is Patzcuaro.